A waterfall filter is generally built directly into a waterfall, although they don't have to be. They can be set next to a pond or stream and will provide a smooth, even flow of water for the most natural look. Water is pumped into the filter and flows up through both mechanical and biological filtration media before overflowing via gravity back into the pond. Many types also allow plants to be added directly to the filter, adding the extra component of phyto-filtration or plant filtration. 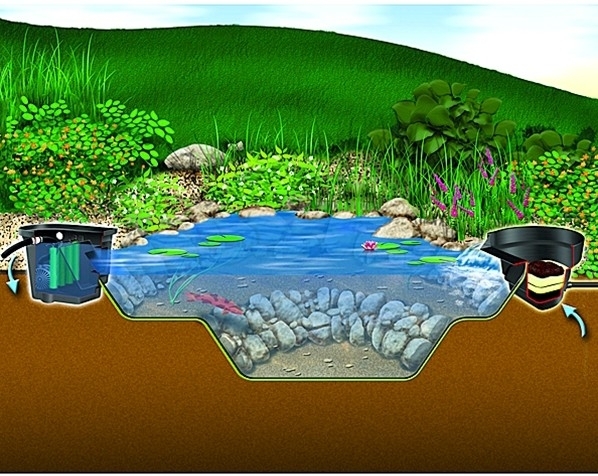 Waterfall filters are easy to install into ponds or waterfalls as they are being built, are very easy to maintain, and are very effective and versitile pond filters. When used in conjuction with a pond skimmer a waterfall filter is the ideal method of filtration for small to large ponds and water features.